During normal abdominal development, the 3 divisions of the GI tract (ie, foregut, midgut, hindgut) herniate out from the abdominal cavity, where they then undergo a 270º counterclockwise rotation around the superior mesenteric vessels. Following this rotation, the bowels return to the abdominal cavity, with fixation of the duodenojejunal loop to the left of the midline and the cecum in the right lower quadrant. Intestinal malrotation occurs due to disruption of the normal embryologic development of the bowel. Understanding of normal abdominal development aids in the understanding of the etiology of the clinical findings seen with malrotation. The alimentary tract develops from the embryologic foregut, midgut, and hindgut. Normal rotation takes place around the superior mesenteric artery (SMA) as the axis. It is described by referring to 2 ends of the alimentary canal, the proximal duodenojejunal loop and the distal cecocolic loop, and is usually divided into 3 stages. Both loops make a total of 270° in rotation during normal development. Both loops start in a vertical plane parallel to the SMA and end in a horizontal plane. See the image below. Normal rotation of the intestines during development. The superior mesenteric artery (SMA) is the axis. The duodenojejunal loop (red arrow) begins superior to the SMA, and the cecocolic loop (green arrow) begins inferior to the SMA. Stage I occurs between 5-10 weeks' gestation. It is the period of physiologic herniation of the bowel into the base of the umbilical cord. The duodenojejunal loop begins superior to the SMA at a 90° position and rotates 180° in a counterclockwise direction. 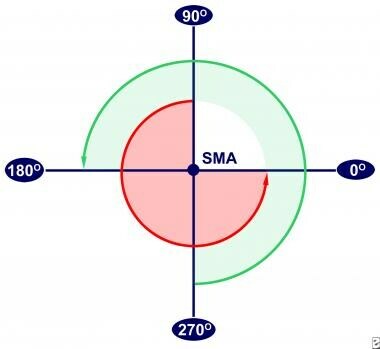 At 180°, the loop is to the anatomical right of the SMA, and by 270°, it is beneath the SMA. The cecocolic loop begins beneath the SMA at 270°. It rotates 90° in a counterclockwise manner and ends at the anatomical left of the SMA at a 0° position. Both loops maintain these positions until the bowel returns to the abdominal cavity. Also during this period, the midgut lengthens along the SMA, and, as rotation continues, a broad pedicle is formed at the base of the mesentery. This broad base protects against midgut volvulus. Stage II occurs at 10 weeks' gestation, the period when the bowel returns to the abdominal cavity. As it return s, the duodenojejunal loop rotates an additional 90° to end at the anatomical left of the SMA, the 0° position. The cecocolic loop turns 180° more as it reenters the abdominal cavity. This turn places it to the anatomical right of the SMA, a 180° position. Stage III lasts from 11 weeks' gestation until term. It involves the descent of the cecum to the right lower quadrant and fixation of the mesenteries. Arrest in development at stage I results in nonrotation. Subsequently, the duodenojejunal junction does not lie inferior and to the left of the SMA, and the cecum does not lie in the right lower quadrant. The mesentery in turn forms a narrow base as the gut lengthens on the SMA without rotation, and this narrow base is prone to clockwise twisting leading to midgut volvulus. The width of the base of the mesentery is different in each patient, and not every patient with nonrotation develops midgut volvulus. Stage II arrest results in incomplete rotation and is most likely to result in duodenal obstruction. Typically, peritoneal bands running from the misplaced cecum to the mesentery compress the third portion of the duodenum. Depending on how much rotation was completed prior to arrest, the mesenteric base may be narrow and, again, midgut volvulus can occur. Internal herniations may also occur with incomplete rotation if the duodenojejunal loop does not rotate but the cecocolic loop does rotate. This may trap most of the small bowel in the mesentery of the large bowel, creating a right mesocolic (paraduodenal) hernia. Potential hernia pouches form when the mesentery of the right and left colon and the duodenum do not become fixed to the retroperitoneum. If the descending mesocolon between the inferior mesenteric vein and the posterior parietal attachment remains unfixed, the small intestine may push out through the unsupported area as it migrates to the left upper quadrant. This creates a left mesocolic hernia with possible entrapment and strangulation of the bowel. If the cecum remains unfixed, volvulus of the terminal ileum, cecum, and proximal ascending colon may occur. Male predominance is observed in neonatal presentations at a male-to-female ratio of 2:1. No sexual predilection is observed in patients older than 1 year. Lee HC, Pickard SS, Sridhar S, Dutta S. Intestinal malrotation and catastrophic volvulus in infancy. J Emerg Med. 2012 Jul. 43(1):e49-51. [Medline]. [Full Text]. Zellos A, Zarganis D, Ypsiladis S, Chatzis D, Papaioannou G, Bartsocas C. Malrotation of the intestine and chronic volvulus as a cause of protein-losing enteropathy in infancy. Pediatrics. 2012 Feb. 129(2):e515-8. [Medline]. Mall FP. Development of the human intestine and its position in the adult. 1898. 9:197-208. Dott NM. Anomalies of intestinal rotation: their embryology and surgical aspects: with report of 5 cases. Br J Surg. 1923. 24:251-286. Ladd WE. Congenital Obstruction of the Duodenum in Children. N Engl J Med. 1932. 206:277-80. Warner B. Malrotation. Oldham KT, Colombani PM, Foglia RP, eds. Surgery of Infants and Children: Scientific Principles and Practice. Philadelphia: Lippincott Williams & Wilkins; 1997. 1229. Dilley AV, Pereira J, Shi EC, Adams S, Kern IB, Currie B. The radiologist says malrotation: does the surgeon operate?. Pediatr Surg Int. 2000. 16(1-2):45-9. [Medline]. Berseth CL. Disorders of the intestines and pancreas. Taeusch WH, Ballard RA, eds. Avery’s Diseases of the Newborn. 7th ed. Philadelphia: WB Saunders; 1998. 918. Varetti C, Meucci D, Severi F, Di Maggio G, Bocchi C, Petraglia F, et al. Intrauterine volvulus with malrotation: prenatal diagnosis. Minerva Pediatr. 2013 Apr. 65(2):219-23. [Medline]. Smith EI. Malrotation of the intestine. Welch KJ, Randolph JG, Ravitch MN, eds. Pediatric Surgery. 4th ed. St. Louis: MO: Mosby-Year Book; 1986. Vol 2: 882-95. Glover DM, Barry FM. Intestinal obstruction in the newborn. Ann Surg. 1949 Sep. 130(3):480-511. [Medline]. Messineo A, MacMillan JH, Palder SB, Filler RM. Clinical factors affecting mortality in children with malrotation of the intestine. J Pediatr Surg. 1992 Oct. 27(10):1343-5. [Medline]. Rescorla FJ, Shedd FJ, Grosfeld JL, Vane DW, West KW. Anomalies of intestinal rotation in childhood: analysis of 447 cases. Surgery. 1990 Oct. 108(4):710-5; discussion 715-6. [Medline]. Wallberg SV, Qvist N. Increased risk of complication in acute onset intestinal malrotation. Dan Med J. 2013. 60:A4744. Nagdeve NG, Qureshi AM, Bhingare PD, Shinde SK. Malrotation beyond infancy. J Pediatr Surg. 2012 Nov. 47(11):2026-32. [Medline]. Kouwenberg M, Severijnen RS, Kapusta L. Congenital cardiovascular defects in children with intestinal malrotation. Pediatr Surg Int. 2008 Mar. 24(3):257-63. [Medline]. [Full Text]. Nehra D, Goldstein AM. Intestinal malrotation: varied clinical presentation from infancy through adulthood. Surgery. 2011 Mar. 149(3):386-93. [Medline]. Kotobi H, Tan V, Lefèvre J, Duramé F, Audry G, Parc Y. Total midgut volvulus in adults with intestinal malrotation. Report of eleven patients. J Visc Surg. 2016 Nov 22. [Medline]. Durkin ET, Lund DP, Shaaban AF, Schurr MJ, Weber SM. Age-related difference in diagnosis and morbidity of intestinal malrotation. J Am Coll Surg. 2008. 206:658-663. Yin Y, Li C, Xu C, Wu L, Deng N, Hou H, et al. Intestinal obstruction due to congenital malrotation complicating a multiple pregnancy: A rare case report. J Pak Med Assoc. 2017 Feb. 67 (2):308-310. [Medline]. Gião Antunes AS, Peixe B, Guerreiro H. Midgut Volvulus as a Complication of Intestinal Malrotation in Pregnancy. ACG Case Rep J. 2017 Jan 18. 4:e9. [Medline]. Esterson YB, Villani R, Dela Cruz RA, Friedman B, Grimaldi GM. Small bowel volvulus in pregnancy with associated superior mesenteric artery occlusion. Clin Imaging. 2017 Mar - Apr. 42:228-231. [Medline]. Wanjari AK, Deshmukh AJ, Tayde PS, Lonkar Y. Midgut malrotation with chronic abdominal pain. N Am J Med Sci. 2012 Apr. 4(4):196-8. [Medline]. [Full Text]. Spitz L, Orr JD, Harries JT. Obstructive jaundice secondary to chronic midgut volvulus. Arch Dis Child. 1983 May. 58(5):383-5. [Medline]. Applegate KE, Anderson JM, Klatte EC. Intestinal malrotation in children: a problem-solving approach to the upper gastrointestinal series. Radiographics. 2006 Sep-Oct. 26(5):1485-500. [Medline]. Lin JN, Lou CC, Wang KL. Intestinal malrotation and midgut volvulus: a 15-year review. J Formos Med Assoc. 1995 Apr. 94(4):178-81. [Medline]. Sizemore AW, Rabbani KZ, Ladd A, Applegate KE. Diagnostic performance of the upper gastrointestinal series in the evaluation of children with clinically suspected malrotation. Pediatr Radiol. 2008 May. 38(5):518-28. [Medline]. Fonio P, Coppolino F, Russo A, D'Andrea A, Giannattasio A, Reginelli A. Ultrasonography (US) in the assessment of pediatric non traumatic gastrointestinal emergencies. Crit Ultrasound J. 2013 Jul 15. 5 Suppl 1:S12. [Medline]. Alehossein M, Abdi S, Pourgholami M, Naseri M, Salamati P. Diagnostic accuracy of ultrasound in determining the cause of bilious vomiting in neonates. Iran J Radiol. 2012 Nov. 9(4):190-4. [Medline]. Zhang W, Sun H, Luo F. The efficiency of sonography in diagnosing volvulus in neonates with suspected intestinal malrotation. Medicine (Baltimore). 2017 Oct. 96 (42):e8287. [Medline]. Hennessey I, John R, Gent R, Goh DW. Utility of sonographic assessment of the position of the third part of the duodenum using water instillation in intestinal malrotation: a single-center retrospective audit. Pediatr Radiol. 2014 Apr. 44(4):387-91. [Medline]. Quail MA. Question 2. Is Doppler ultrasound superior to upper gastrointestinal contrast study for the diagnosis of malrotation?. Arch Dis Child. 2011 Mar. 96(3):317-8. [Medline]. Shahverdi E, Morshedi M, Allahverdi Khani M, Baradaran Jamili M, Shafizadeh Barmi F. Utility of the CT Scan in Diagnosing Midgut Volvulus in Patients with Chronic Abdominal Pain. Case Rep Surg. 2017. 2017:1079192. [Medline]. Catania VD, Lauriti G, Pierro A, Zani A. Open versus laparoscopic approach for intestinal malrotation in infants and children: a systematic review and meta-analysis. Pediatr Surg Int. 2016 Dec. 32 (12):1157-1164. [Medline]. Arnaud AP, Suply E, Eaton S, Blackburn SC, Giuliani S, Curry JI, et al. Laparoscopic Ladd's procedure for malrotation in infants and children is still a controversial approach. J Pediatr Surg. 2018 Oct 28. [Medline]. Dassinger MS, Smith SD. Chapter 86. Disorders of Intestinal Rotation and Fixation. Coran A, Adzick NS, Krummel TM, et al, eds. Pediatric Surgery. 7th ed. Elsevier; 837-51. Badea R, Al Hajjar N, Andreica V, Procopet B, Caraiani C, Tamas-Szora A. Appendicitis associated with intestinal malrotation: imaging diagnosis features. Case report. Med Ultrason. 2012 Jun. 14(2):164-7. [Medline]. Tsao KJ, St Peter SD, Valusek PA, Keckler SJ, Sharp S, Holcomb GW 3rd. Adhesive small bowel obstruction after appendectomy in children: comparison between the laparoscopic and open approach. J Pediatr Surg. 2007 Jun. 42(6):939-42; discussion 942. [Medline]. Kinlin C, Shawyer AC. The surgical management of malrotation: A Canadian Association of Pediatric Surgeons survey. J Pediatr Surg. 2017 Jan 28. [Medline]. Huntington JT, Lopez JJ, Mahida JB, Ambeba EJ, Asti L, Deans KJ, et al. Comparing laparoscopic versus open Ladd's procedure in pediatric patients. J Pediatr Surg. 2016 Oct 30. [Medline]. Palanivelu C, Rangarajan M, Shetty AR, Jani K. Intestinal malrotation with midgut volvulus presenting as acute abdomen in children: value of diagnostic and therapeutic laparoscopy. J Laparoendosc Adv Surg Tech A. 2007 Aug. 17(4):490-2. [Medline]. Stanfill AB, Pearl RH, Kalvakuri K, Wallace LJ, Vegunta RK. Laparoscopic Ladd's procedure: treatment of choice for midgut malrotation in infants and children. J Laparoendosc Adv Surg Tech A. 2010 May. 20(4):369-72. [Medline]. Ferrero L, Ben Ahmed Y, Philippe P, Reinberg O, Lacreuse I, Schneider A, et al. Intestinal Malrotation and Volvulus in Neonates: Laparoscopy Versus Open Laparotomy. J Laparoendosc Adv Surg Tech A. 2017 Jan 5. [Medline]. Vassaur J, Vassaur H, Buckley FP 3rd. Single-incision laparoscopic Ladd's procedure for intestinal malrotation. JSLS. 2014 Jan-Mar. 18(1):132-5. [Medline]. Ooms N, Matthyssens LE, Draaisma JM, de Blaauw I, Wijnen MH. Laparoscopic Treatment of Intestinal Malrotation in Children. Eur J Pediatr Surg. 2015 Jun 18. [Medline]. Newman B, Koppolu R, Murphy D, Sylvester K. Heterotaxy syndromes and abnormal bowel rotation. Pediatr Radiol. 2014 May. 44(5):542-51. [Medline]. Pockett CR, Dicken B, Rebeyka IM, Ross DB, Ryerson LM. Heterotaxy syndrome: is a prophylactic Ladd procedure necessary in asymptomatic patients?. Pediatr Cardiol. 2013 Jan. 34(1):59-63. [Medline]. Cullis PS, Siminas S, Losty PD. Is Screening of Intestinal Foregut Anatomy in Heterotaxy Patients Really Necessary? : A Systematic Review in Search of the Evidence. Ann Surg. 2016 Dec. 264 (6):1156-1161. [Medline]. Elsinga RM, Roze E, Van Braeckel KN, Hulscher JB, Bos AF. Motor and cognitive outcome at school age of children with surgically treated intestinal obstructions in the neonatal period. Early Hum Dev. 2013 Mar. 89(3):181-5. [Medline]. Feitz R, Vos A. Malrotation: the postoperative period. J Pediatr Surg. 1997 Sep. 32(9):1322-4. [Medline]. Ai VH, Lam WW, Cheng W. CT appearance of midgut volvulus with malrotation in a young infant. ClinRadiol. Oct 1999. 54(10):687-9. Bass KD, Rothenberg SS, Chang JH. Laparoscopic Ladd's procedure in infants with malrotation. J Pediatr Surg. 1998 Feb. 33(2):279-81. [Medline]. Chao HC, Kong MS, Chen JY, Lin SJ, Lin JN. Sonographic features related to volvulus in neonatal intestinal malrotation. J Ultrasound Med. 2000 Jun. 19(6):371-6. [Medline]. Estrada RL. Thomas CC, ed. Anomalies of Intestinal Rotation and Fixation. Springfield, IL: 1958. Guzzetta PC, Anderson KD, Eichelberger MR. General Surgery. Avery GB, Fletcher MA, MacDonald MG, eds. Neonatology: Pathophysiology and Management of the Newborn. Philadelphia, PA: Lippincott Williams & Wilkins; 1994. 931-2. Howell CG, Vozza F, Shaw S, Robinson M, Srouji MN, Krasna I. Malrotation, malnutrition, and ischemic bowel disease. J Pediatr Surg. 1982 Oct. 17(5):469-73. [Medline]. Irish MS, Pearl RH, Caty MG, Glick PL. The approach to common abdominal diagnosis in infants and children. Pediatr Clin North Am. 1998 Aug. 45(4):729-72. [Medline]. Janik JS, Ein SH. Normal intestinal rotation with non-fixation: a cause of chronic abdominal pain. J Pediatr Surg. 1979 Dec. 14(6):670-4. [Medline]. Kamal IM. Defusing the intra-abdominal ticking bomb: intestinal malrotation in children. CMAJ. 2000 May 2. 162(9):1315-7. [Medline]. Kullendorff CM, Mikaelsson C, Ivancev K. Malrotation in children with symptoms of gastrointestinal allergy and psychosomatic abdominal pain. Acta Paediatr Scand. 1985 Mar. 74(2):296-9. [Medline]. Kumar D, Brereton RJ, Spitz L, Hall CM. Gastro-oesophageal reflux and intestinal malrotation in children. Br J Surg. 1988 Jun. 75(6):533-5. [Medline]. [Guideline] Ladd WE. Surgical Diseases of the Alimentary Tract in Infants. N Engl J Med. 1936. 215:705-8. Mazziotti MV, Strasberg SM, Langer JC. Intestinal rotation abnormalities without volvulus: the role of laparoscopy. J Am Coll Surg. 1997 Aug. 185(2):172-6. [Medline]. Spigland N, Brandt ML, Yazbeck S. Malrotation presenting beyond the neonatal period. J Pediatr Surg. 1990 Nov. 25(11):1139-42. [Medline]. In this upper GI series with abnormal results, the duodenum does not cross the midline, and the small bowel is present only in the right side of the abdomen. These 2 lower GI series show the cecum (arrows) in the right upper quadrant, indicative of malrotation. This patient had malrotation with midgut volvulus. The gut is darkened in color because of ischemia. What Is Chromosome 22q11.2 Deletion Syndrome, and Why Do You Need to Know?